The internet is a magic thing! 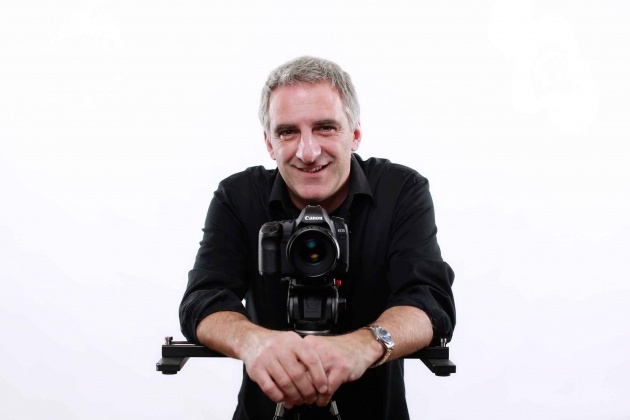 Today I am sharing a blog about my film making colleague from across the globe, Sylvain Renaud from Reno Video Productions who has teamed up with his wife Caroline to provide a professional film production service in Ottawa, Canada. The amazing thing about this is that Sylvain (Syl) and I have never physically met. He lives on the other side of the globe, compared to where I live, 'down under' here in Adelaide, South Australia, yet we are good friends and respectful colleagues. I interviewed Syl about his latest film London Real = Brian Rose + Nic Gabriel which has been incredibly successful. It explores the endless subject matter explored by Nic and Brian who run a weekly discussion about all aspects of the human experience on their site London Real . I was amazed by Syl's storytelling and use of visual imagery including some of his own, and stock time lapse footage of London. Here's what Syl had to say. 1. What is your background in film making? I've been shooting and editing video since 1982 it was a part time job mostly shooting weddings and sports. In 2009 my wife Caroline and I decided to buy the company from my brother and I became a full time cinematographer/editor / Producer we invested over $50k in new equipment and switched over to H DSLR gear three (Cannon) 5d mark II's and one 7d and all the cinematic toys like sliders, Steadicam, cranes, audio recorders and 3 full stand- alone Editors. I am completely self-taught with no film school training. You see, I was supposed to be a rock star bass player in the band (LOL) when that didn't work out I spent 25 years as a FedEx courier in Ottawa, Canada. Three years ago my wife began learning how to shoot so we are always together on most shoots including London Real. We bounce ideas off eachother but for the most part it's pretty intuitive and organic. I don't like to storyboard too much. 2.How did you get involved in this project? I stumbled upon London Real while doing a search on YouTube. I started watching one episode then another and finally Caroline and I watched over 40 hours of London Real podcast episodes together, and we couldn't get enough. I found it refreshing to listen to people talk so openly and honestly about a variety of subjects without the constraint of any censorship either through sponsors or the hosts themselves. I just cannot find this type of open dialog on television. I quickly became connected with Brian and Nic through social media and messaged them through Facebook about a possible profile describing the 'Genesis of London Real'. It must have been weird for them. We knew a lot about them through watching so many hours (of London Real podcasts) but they knew nothing about us. Next thing, we are on a plane heading to London just a few weeks later. 3.Tell us a little about the production. How long did it take to shoot? What camera did you use and why? What other equipment? What sound recording gear did you use? We only had 3 days to shoot everything so there was very limited time to get it right. 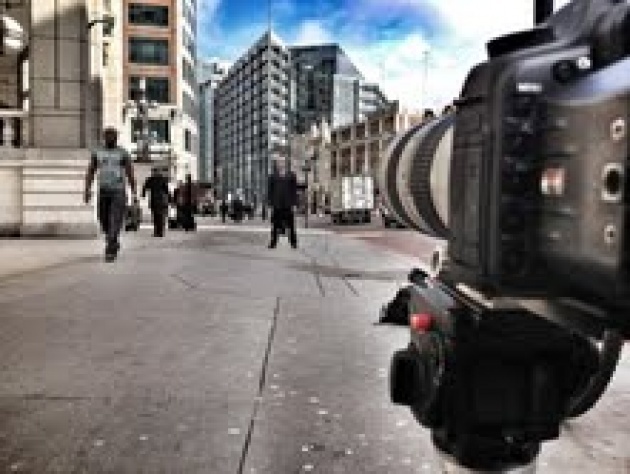 I used mostly the 5d markII but some b-roll segments were shot with the 7d. Lenses all L-series 35mm 50mm & 70-200mm. The 5d was a real game changer for me with it's big full frame sensor which is so addictive. It's been a three year love affair and until 4k becomes the standard, I don't see myself going to something else anytime soon. We brought 1 monopod, 1 mini slider 18 inches, and a very small compact tripod. We had to travel light. Interviews were recorded with the Zoom H4n lap mics and other b-roll audio was straight from the camera. 4. 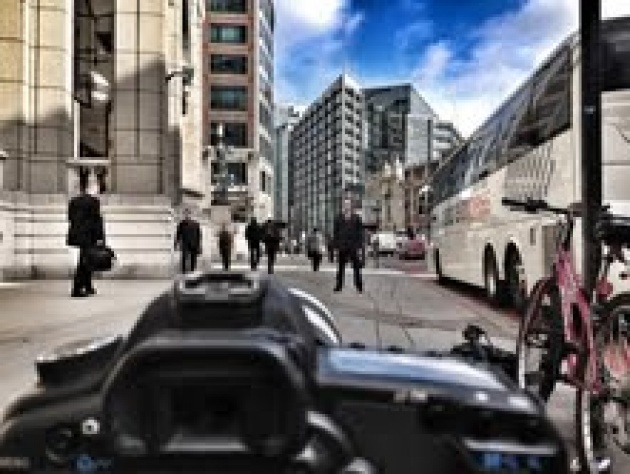 There are some amazing time-lapse sequences in the film, one of a busy London intersection. How did you do them? How long did it take? Half the time lapses were mine and the other half were bought royalty free. We just did not have enough time in London so I had to compromise. 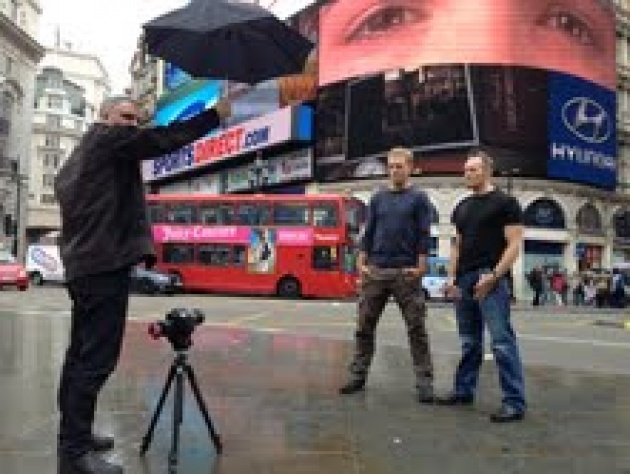 The Piccadilly square time lapse was 12 minutes of the guys looking straight into the lens. The feeling I wanted was to show Brian and Nic as the stable voice of reason behind our fast pace western society in the background. 5. Tell us a little about post production? Who’s music? The music is an instrumental version of "Hold me together" by Loud Harp rights purchased from The Music bed. 6. How did you distribute this film? The film was loaded on Vimeo and used on the London Real website home page. The file was also downloaded on the London Real You Tube channel. Its currently sitting at over 34k plays and counting. The podcasts themselves had over 5 million hits since they appeared in the Joe Rogan Experience Podcast from Los Angeles back in October 2012 just before the launch of this profile. 7. What are the future plans for London Real? London Real is currently putting out 2 episodes per week and the sky is the limit.